As promised, Linda and I are very pleased to present a second excerpt from The World of Ice and Fire (Pre-order: Amazon US, Amazon UK), following George’s excerpt from last month. Our own excerpt features the beginning of “The Ten Thousand Ships”, the section devoted to the events leading to the arrival of the Rhoynar in Westeros, beginning with the relationship—and eventual conflict—between the people of the Rhoyne and the Valyrians. Those of you who’ve looked at the other available glimpses of the book know, the book’s richly illustrated with beautiful artwork from many artists. Below, you’ll find one of those pieces of art, a depiction of Princess Nymeria by artist J.K. Drummond. And as an added bonus, at the end of the extract is a video Linda and I recoreded from our Youtube channel, discussing the origins of the book, the writing process, and going over some of its content. Enjoy! The last of the great migrations into Westeros happened long after the coming of the First Men and the Andals. For once the Ghiscari wars had ended, the dragonlords of Valyria turned their gaze toward the west, where the growth of Valyrian power brought the Freehold and its colonies into conflict with the peoples of the Rhoyne. The mightiest river in the world, the Rhoyne’s many tributaries stretched across much of western Essos. Along their banks had arisen a civilization and culture as storied and ancient as the Old Empire of Ghis. The Rhoynar had grown rich off the bounty of their river; Mother Rhoyne, they named her. Fishers, traders, teachers, scholars, workers in wood and stone and metal, they raised their elegant towns and cities from the headwaters of the Rhoyne down to her mouth, each lovelier than the last. There was Ghoyan Drohe in the Velvet Hills, with its groves and waterfalls; Ny Sar, the city of fountains, alive with song; Ar Noy on the Qhoyne, with its halls of green marble; pale Sar Mell of the flowers; sea-girt Sarhoy with its canals and saltwater gardens; and Chroyane, greatest of all, the Festival City with its great Palace of Love. Art and music flourished in the cities of the Rhoyne, and it is said their people had their own magic-a water magic very different from the sorceries of Valyria, which were woven of blood and fire. Though united by blood and culture and the river that had given them birth, the Rhoynish cities were elsewise fiercely independent, each with its own prince . . . or princess, for amongst these river folk, women were regarded as the equals of men. By and large a peaceful people, the Rhoynar could be formidable when roused to wroth, as many a would-be Andal conqueror learned to his sorrow. The Rhoynish warrior with his silver-scaled armor, fish-head helm, tall spear, and turtle-shell shield was esteemed and feared by all those who faced him in battle. 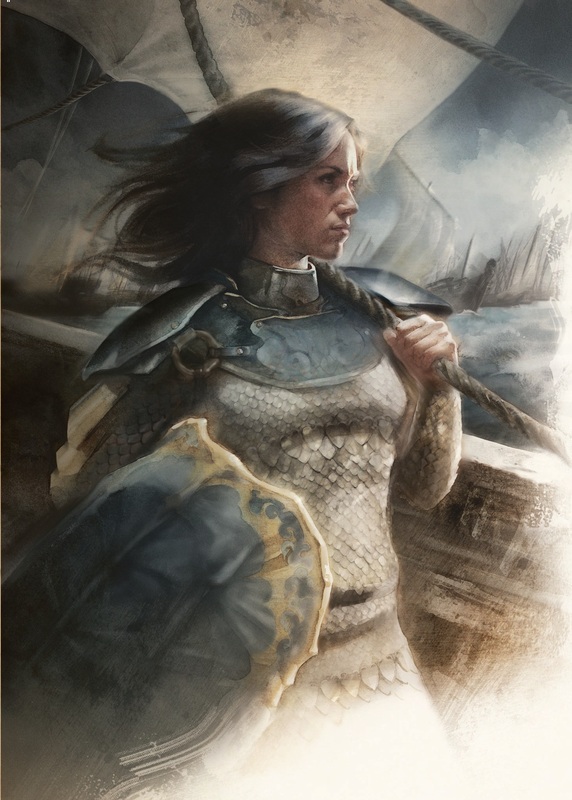 It was said the Mother Rhoyne herself whispered to her children of every threat, that the Rhoynar princes wielded strange, uncanny powers, that Rhoynish women fought as fiercely as Rhoynish men, and that their cities were protected by “watery walls” that would rise to drown any foe. For many centuries the Rhoynar lived in peace. Though many a savage people dwelt in the hills and forests around Mother Rhoyne, all knew better than to molest the river folk. And the Rhoynar themselves showed little interest in expansion; the river was their home, their mother, and their god, and few of them wished to dwell beyond the sound of her eternal song. When adventurers, exiles, and traders from the Freehold of Valyria began to expand beyond the Lands of the Long Summer after the end of the Fifth Ghiscari War, the Rhoynish princes embraced them at first, and their priests declared that all men were welcome to share the bounty of Mother Rhoyne. As those first Valyrian outposts grew into towns, and those towns into cities, however, some Rhoynar came to regret the forbearance of their fathers. Amity gave way to enmity, particularly upon the lower river, where the ancient city of Sar Mell and the walled Valyrian town Volon Therys faced each other across the waters, and on the shores of the Summer Sea, where the Free City of Volantis soon rivaled the storied port of Sarhoy, each of them commanding one of Mother Rhoyne’s four mouths. Disputes between the citizens of the rival cities became ever more common and ever more rancorous, finally giving birth to a series of short but bloody wars. Sar Mell and Volon Therys were the first cities to meet in battle. Legend claims that the clash began when the Valryians netted and butchered one of the gigantic turtles the Rhoynar called the Old Men of the River and held sacred as the consorts of Mother Rhoyne herself. The First Turtle War lasted less than a moon’s turn. Sar Mell was raided and burned, yet emerged victorious when Rhoynish water wizards called up the power of the river and flooded Volon Therys. Half the city was washed away if the tales can be believed. Other wars followed, however: the War of Three Princes, the Second Turtle War, the Fisherman’s War, the Salt War, the Third Turtle War, the War on Dagger Lake, the Spice War, and many more, too numerous to recount here. Cities and towns were burned, drowned, and rebuilt. Thousands were killed or enslaved. In these conflicts, the Valyrians emerged as victors more oft than not. The princes of the Rhoyne, fiercely proud of their independence, fought alone, whilst the Valyrian colonies aided one another, and when hard-pressed called upon the power of the Freehold itself. Beldecar’s History of the Rhoynish Wars is without equal in describing these conflicts, which stretched over the best part of two and a half centuries. This series of conflicts reached a bloody climax a thousand years ago in the Second Spice War, when three Valyrian dragonlords joined with their kin and cousins in Volantis to overwhelm, sack, and destroy Sarhoy, the great Rhoynar port city upon the Summer Sea. The warriors of Sarhoy were slaughtered savagely, their children carried off into slavery, and their proud pink city put to the torch. Afterward the Volantenes sowed the smoking ruins with salt so that Sarhoy might never rise again. The utter destruction of one of the richest and most beautiful of the cities of the Rhoyne, and the enslavement of her people, shocked and dismayed the remaining Rhoynar princes. “We shall all be slaves unless we join together to end this threat,” declared the greatest of them, Garin of Chroyane. This warrior prince called upon his fellows to join with him in a great alliance, to wash away every Valyrian city on the river. Only Princess Nymeria of Ny Sar spoke against him. “This is a war we cannot hope to win,” she warned, but the other princes shouted her down and pledged their swords to Garin. Even the warriors of her own Ny Sar were eager to fight, and Nymeria had no choice but to join the great alliance. Garin divided his enormous host into three parts; one marched down the east bank of the Rhoyne, one along the west, whilst a huge fleet of war galleys kept pace on the waters between, sweeping the river clean of enemy ships. From Chroyane, Prince Garin led his gathered might downriver, destroying every village, town, and outpost in his path and smashing all opposition. At Selhorys he won his first battle, overwhelming a Valyrian army thirty thousand strong and taking the city by storm. Valysar met the same fate. At Volon Therys, Garin found himself facing a hundred thousand foes, a hundred war elephants, and three dragonlords. Here too he prevailed, though at great cost. Thousands burned, but thousands more sheltered in the shallows of the river, whilst their wizards raised enormous waterspouts against the foe’s dragons. Rhoynish archers brought down two of the dragons, whilst the third fled, wounded. In the aftermath, Mother Rhoyne rose in rage to swallow Volon Therys. Thereafter men began to name the victorious prince Garin the Great, and it is said that, in Volantis, great lords trembled in terror as his host advanced. Rather than face him in the field, the Volantenes retreated back behind their Black Walls and appealed to the Freehold for help. And the dragons came. Not three, as Prince Garin had faced at Volon Therys, but three hundred or more, if the tales that have come down to us can be believed. Against their fires, the Rhoynar could not stand. Tens of thousands burned whilst others rushed into the river, hoping that the embrace of Mother Rhoyne would offer them protection against dragonflameÂ%A0.Â%A0.Â%A0.Â%A0only to drown in their mother’s embrace. Some chroniclers insist that the fires burned so hot that the very waters of the river boiled and turned to steam. Garin the Great was captured alive and made to watch his people suffer for their defiance. His warriors were shown no such mercy. The Volantenes and their Valyrian kin put them to the sword-so many that it was said that their blood turned the great harbor of Volantis red as far as the eye could see. Thereafter the victors gathered their own forces and moved north along the river, sacking Sar Mell savagely before advancing on Chroyane, Prince Garin’s own city. Locked in a golden cage at the command of the dragonlords, Garin was carried back to the festival city to witness its destruction.